Naftali Bennett warns that efforts to de-escalate conflict with Hamas could backfire, lead to full-scale war. 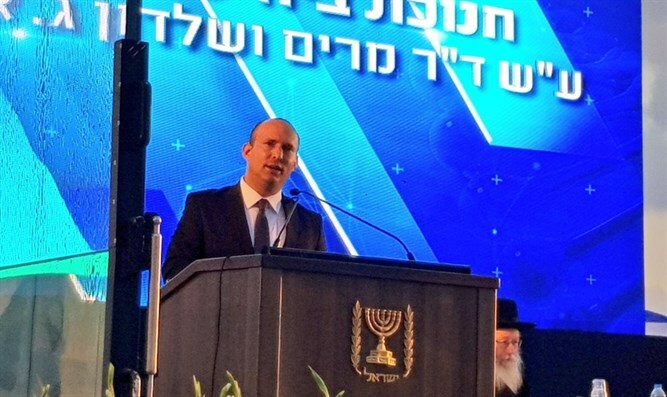 Education Minister Naftali Bennett (Jewish Home) warned Sunday evening that efforts to avoid a conflict with the Hamas terrorist organization in Gaza could potentially lead to a larger war with the terror group. Bennett made the comments at a ceremony marking the opening of the new medical department at Ariel University, in Samaria. Amid efforts to avoid further escalations between the Gaza-based terror group Hamas and Israel following a spate of rocket attacks and attempted border infiltrations, Bennett warned that Hamas would not adhere to any ceasefire agreements. Rather, Bennett argued, Hamas is looking to pressure Israeli leaders into taking the path of least resistance, by extracting concessions in exchange for a temporary ceasefire. Bennett has over the past few days criticized efforts by Defense Minister Avigdor Liberman to reach an agreement with Hamas leaders for a ceasefire. Liberman has pushed for a ceasefire agreement in the hopes of reversing the rise in tensions along the Gaza border, following months of arson attacks by Hamas terrorists, the launching of dozens of rockets and mortars into Israeli territory, and the murder of an IDF soldier by a Hamas sniper.